Before making my final-final decision on the saddle I had on trial, I took one more ride in it. Wizard’s demeanor has improved. He’s still a little grouchy about grooming, but not as sore as he was. Every night, he gets his Back on Track sheet on him, and I longed him before I rode to let him loosen up on his own before riding. I did not put side reins on, just let him carry himself how he wanted to carry himself. They had just dragged the arena and the footing was really nice. He went both right and left on the longe really nicely. When I got in the saddle, there was much less fuss and pinned ears than in the past few rides. I got a few cranky faces and swishy tails, but there was a marked improvement. 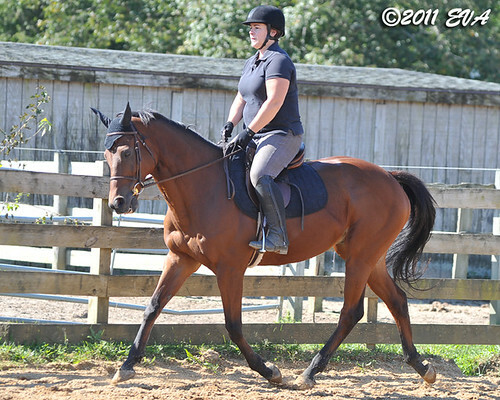 He trotted left and right, and as we did more work, he got better instead of worse. I kept the ride short and sweet, and checked the sweat marks after our ride. The sweat was perfect down each side of his spine, with great spine clearance. Wither tops are not getting pressed by the saddle. The hair looks different behind the withers, but I’ve heard mixed things about that. I made up my mind to keep the saddle (and sell all of my other ones that don’t fit him). Fingers crossed for more improvement. I could really use some nice October rides!